We publish a newsletter Update showing our activities each month, including crime news, general information and even fun stuff. The latest UPDATE can be found by clicking here! To see other monthly reports, click here. Want to receive this automatically every month? If you would like to be added to our MONTHLY REPORT e-mail list, click here. Specify MONTHLY REPORT in your response. Having a bad day? Be inspired by Abigail and her courageous battle. Its two minutes of your time that you will remember for a while. To meet Abigail, click here. The Greenhills Police Department has released its 2018 Annual Report. It contains stories, pictures, and a year in the life of the Greenhills Police Department, its officers and staff, and our residents. Our prayers go out to the Clermont County Sheriff's Department. Our prayers go out to the Colerain Police Department during this difficult time. The first initiative was fun. The last two benefited those who needed their holidays brightened. All of this was made possible by the generous donations of Greenhills citizens. For them, we are truly grateful. For details about these three things, click here! Shop with a Cop happened on Saturday, December 15, and the holidays were brightened for all involved. For additional photos and information, click here. From all of us at the Greenhills Police Department . . . The members of the Greenhills Police Department are sincerely thankful to the residents in our community who approved the recent police levy by a significant margin. In partnership with you, our citizens, we pledge to continue to excel in providing dependable and professional service to ensure the safety of our community. Always shop only with trusted online retailers. That means using a retailer you already know or one that is verified through another trusted entity. If you find a new possible shop to do business with, but are unsure about its reputation, try to find reviews from trusted sources such as the Better Business Bureau. Even though an untrusted site might have the best prices, it is worth it to use a trusted online shop that is known to safeguard your contact, credit card information, and purchases. Whether you are downloading a store app to get a coupon, a deal aggregator app to comparison shop, or a reward app that ensures you get points or cash back, it is important to stick to trusted apps from known developers. Unfortunately, fake apps appear in the app stores, purporting to be from a trusted source while other apps exist to capture your data without providing the services they claim to support. You can avoid many malicious apps by downloading your apps from Google Play, Apple App Store, Microsoft Store, or another trusted platform, selectively choosing which apps to download, and making sure you carefully read the permissions and app reviews. Never shop or conduct banking on unencrypted or public Wi-Fi – It is best to always conduct financial transactions or log on to sensitive accounts via a trusted Wi-Fi network. Look for the lock icon on your browser - When a site has a lock icon on the browser window, or in the URL bar, it indicates that your communications with the site are encrypted. If you do not see a lock, look for “https” at the beginning of the URL, as this is the same thing as the lock. While not 100%, it reduces chances of using an insecure website for your transactions. Be sure to use a strong, unique password. Always use more than ten characters, with numbers, special characters, and upper- and lower-case letters. The longer the better! If you have an established account with a retailer, do not store your payment information with them. In the case of an account compromise, stored payment information may allow a criminal to make purchases using your financial information. Look out for suspicious or unexpected emails – A common tactic of cybercriminals year-round is to send fraudulent emails seeking to get you to click a link or open an attachment. When it comes to this time of year, they may make an email look like it contains tracking information for a shipment or a promotion for a store. The link or attachment might download malware or try to get you to enter your user credentials in a convincing, yet fraudulent login screen, so they can steal your password. Always avoid clicking direct links in emails, and if you receive an email with a tracking number in it, head to the shipping carrier’s website in your browser and copy and paste the tracking number itself into the site. Multiple cases of thefts from vehicles on the east side of Greenhills have been cleared after a search warrant was executed on October 25th on Foxworth Lane. This action resulted in three arrests, the recovery of much of the stolen property, and the confiscation of drugs and drug paraphernalia. For details, click here. The attempted abduction case of an eleven year old boy on a bike has been closed as the result of an investigation and a recent change in Ohio law. For details, click here. A multi-state crime spree, extending from West Chester into Northern Kentucky, and including Greenhills and Cincinnati, was brought to a halt on September 3rd due to the good investigative instincts of a Greenhills police officer. A group of criminals defrauded merchants throughout the Greater Cincinnati area out of merchandise that will easily exceed $100,000 in value. Details can be found here. I don’t post on Facebook very often but today has been a bit of a rough day. I just left the scene of a mass shooting at 5/3 Bank. I arrived about 30 seconds after it was over. I was there for five hours and many other officers will be there for far longer. I watched someone’s life slow drain from their body. I heard the phone from one of the victims ring for almost two hours straight. I felt the pain of the person on the other side because I knew what they didn’t ... that their loved one was never going to answer their phone again. I saw the determination on the officers and EMT’s faces as they went about their jobs attempting to save victims and ensure there were no more. I have 9 more hours left in my shift before I can go home. There has been a lot of divisive criticism of police, some deserved, but most is not. We police officers are human too with real emotions and faults as well. Every one of us needs to treat others the way that they would want to be treated. I’m proud of my department and my fellow brother and sister officers today and every day that I’ve worked with them. Everyone please hug your loved ones and live life to the fullest. Summer is over and Winton Woods Schools started on August 20th. An average of 30 pedestrians are killed each year while getting on or off school buses. School bus related crashes kill almost 200 annually and injure an estimated 18,000 persons nationwide according to data from the National Highway Traffic Safety Administration. About 72 percent of the deaths in fatal school bus related crashes were occupants of vehicles other than the school bus and 20 percent were pedestrian related. About 4 percent were school bus passengers and 2 percent were school bus drivers. Of the pedestrians killed in school bus related crashes over this time frame, approximately 77 percent were struck by the school bus itself. For over 22 million students nationwide, the school day begins with and ends with riding a school bus. Unfortunately, each year there are many children injured and several are fatally injured as a result of school bus incidents. Statistically school bus transportation is safer, even safer than cars. However, last year approximately 26 students received fatal injuries and another 9,500 were injured. When driving in neighborhoods with school zones, watch for children traveling to school. Children are unpredictable in their actions, and it is YOUR responsibility to anticipate and prepare to react to what they do. Drive SLOWLY; watch for children walking in the street, especially if there are no sidewalks available. BE ALERT. Children arriving late for the bus may dart into the street and not looking for other cars. Yellow flashing lights- the bus is preparing to stop to load or unload children. Motorists need to slow down and prepare to stop. Prepare a route to the bus stop. This will help children learn the most safe and efficient way to reach the bus stop without getting lost or the possibility of arriving late. Review proper behavior when riding on a school bus. Encourage your child to sit quietly in their seats and to follow the bus driver's instructions. The Greenhills Police Department is a member of DART, the Drug Abuse Reduction Task Force. To learn more about DART, click here. To send us a tip, click here. To send a tip directly to DART, click here. An arrest has been made in the recent criminal damaging incidents reported below. For details, click here. Officers of the Greenhills Police Department, in conjunction with the Drug Abuse Reduction Task Force (DART), and with the assistance of the Colerain Police Department and their canine unit, simultaneously executed search warrants at two residences on Thursday, March 8, 2018 at 2:15 PM, resulting in five drug charges. Both residences were near schools, which under Ohio law, increases the severity of the charges. Nicholas Nolan, 23, of Cincinnati, charged with Drug Abuse, a minor misdemeanor. A child at this location was removed from the residence and turned over to the care of Hamilton County Family Services. Patricia Schwab, 71, of Gambier Circle in Greenhills, charged with Permitting Felony Drug Abuse, a First Degree Misdemeanor. Further charges may result when lab results are received after testing of suspected drugs confiscated during the execution of the search warrants. These actions are the result of complaints and intelligence received, and continue our goal of addressing drug abuse and drug trafficking occurring in our community. See It - Hear It - Report It. That’s what is so remarkable about what our men and women in law enforcement do. It’s that between the easier calls and the hard calls, they know that either one of them can go south quicker than their response time. Cops die. They die heroically doing something a lot of people don’t have the gumption to fathom. They do it willingly, without hesitation, without delay. And even when the moment comes to lay down their life, they do it as selflessly as the day they took an oath to protect and serve their communities. So, no. It won’t stop. Evil will always try to rise. Every day, it’s knocking on our doors and lurking around the corners. There are men and women waiting to rise up and meet it. And they will rise every...single....time. The latest Greenhills Police Department Annual Report has been released. It is chock full of information and pictures - see if you can find yourself or your neighbor in there! Left to right: Larry Smith, Kristina Irby, Lieutenant Anne Ward, Mayor David Moore, Ronald Ahlers, Karen Cartier, David Cartier, Sandy Evans, Chief Neil Ferdelman, and Sergeant Tim Lukes. On November 9, we graduated our third Greenhills Citizens Police Academy Class. Our graduates have told us this was both an interesting and fun experience. Congratulations to them! If there is sufficient interest, we plan to hold another Citizens Police Academy class in February of 2018. The classes will be conducted in five sessions every other Thursday from 6 PM to 8:30 PM starting in mid-February. If you are interested, an application form can be found at this link, in our lobby, or call us at 513-825-2101 and we will mail one to you. 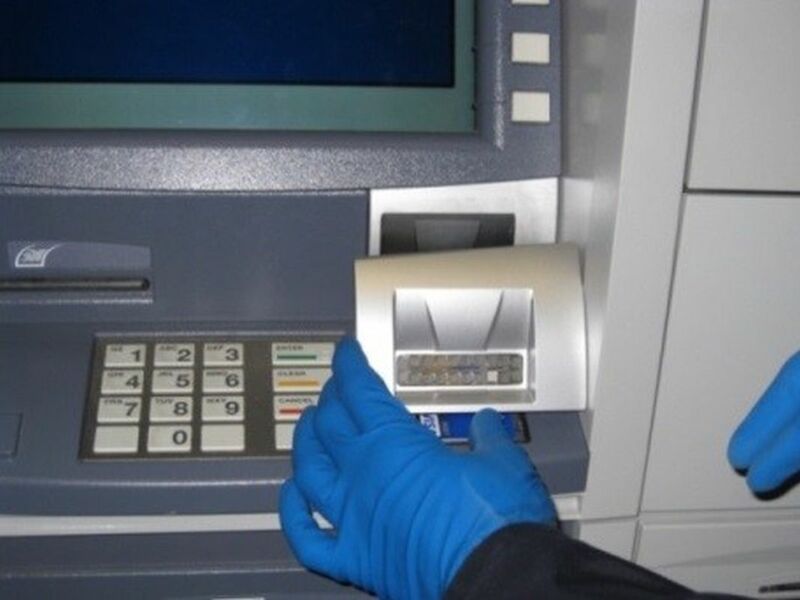 Crooks have become increasingly high-tech, and are waiting to raid your credit card accounts through the use of sophisticated "skimmers" installed at ATMs or other Point of Sale devices. For details, click here! Did you text while driving today? Ever? If you did, this message is for you. If you ever have, click here. This message may change your life. No, scratch that. This message may save your life. Greenhills Police have identified and arrested the man suspected in a fatal shooting outside of a Springdale lounge. Workers at the Indulge VSP Lounge on Glensprings Drive called police to report trouble with a patron early Thursday morning. A fight broke out on the dance floor between Shawndre Houston, 33, and David Salter II, both of Cincinnati. After the bouncer broke it up, Salter's friends reportedly began assaulting Houston. He was repeatedly struck in the face as bouncers attempted to end the second fight. Houston then left the lounge in a gray Hyundai Sonata with his cousins Keonta Hardy and Laray Bush. Houston drove around the club twice before stopping next to Salter. Houston fired five shots from the car, hitting Salter 2-3 times. Salter was taken to Bethesda North Hospital, where he died. The car was spotted and stopped by a Greenhills police officer and the three men were taken into custody. Houston was charged with Aggravated Murder. Hardy, 22, received a charge of Obstructing Justice for denying being at the scene of fight and shooting, contrary to what was seen on surveillance footage. The Greenhills Police Officer was commended for his alertness and diligence. Rights Things the Right Way"
As you know, for the past three days, we underwent a rigorous inspection conducted by two assessors from the Commission on Accreditation for Law Enforcement Agencies, Inc. (CALEA). Some of you met with them or they rode with you. Yesterday afternoon, the assessors met with me, Lieutenant Ward, Sergeant Lukes, Accreditation Manager Vonda Secoy, as well as the Municipal Manager and the Mayor. During this exit briefing, they reported their findings to us that will be relayed to the full Commission. They found us in full compliance with all applicable standards, and will recommend our reaccreditation to the Commission when they next meet in March in Mobile, Alabama. Vonda Secoy and I will have to testify before the Commission at that time and answer any questions they might have. Our assessors concluded that the Greenhills Police Department accomplishes excellent community outreach, and establishes significant relationships between the community and the face behind the badge. These relationships, they observed, have generated goodwill throughout the community. They further observed that our officers are committed to providing excellent customer service to our residents with a focus on continual improvement. Our assessors said they were very impressed with what they saw. They noted that we are a professional, progressive police agency that is doing the right things the right way. The assessors told us that the police employees they spoke with were open, accommodating, and hospitable. A large component of their visit involved public outreach. They spoke to six persons by phone, and 16 persons attended our public hearing on Monday. All of the comments received were complementary and supportive of the department. These persons included residents, Citizens Police Academy alumni, school officials, and police officers and administrators from other jurisdictions. That support comes as the result of the daily interactions that each of us has with them, and it reflects the good work each of you regularly do. The accreditation process is voluntary. There is no state or federal mandate to participate. It is designed for police departments that want to demonstrate excellence in what they do. Our Council chose this path almost a decade ago, and the process continues to promote best practices for our agency, providing a benefit to our officers, staff, and community. Outside experts arrived, observed, and collaboratively proffered suggestions that make us better. It is a commitment to continuous improvement. Thank you for your role in the actions that set us aside as an excellent police department. The CALEA Assessors are pictured above with the GPD Accreditation Team. From left: Greenhills Police Chief Neil Ferdelman, Captain Peg Schmidt-Fuller, Chief John Letteney, Lieutenant Anne Ward, and Accreditation Manager Vonda Secoy. To learn more about CALEA in general, check the link here. To find out more our specific on-site assessment and our assessors, check the link here. In 2015, the Greenhills Council passed an ordinance that will allow the operation of golf carts on our residential streets, with certain limitations. Golf carts are only permitted on village streets where the speed limit is 25 MPH, which means that they cannot be driven on Winton Road (they are permitted to cross Winton). All child safety seat requirements for motor vehicles apply to children under the age of nine. Safety belts are required in the front seat for all. To see all of the items that are inspected as required by Ohio law, click here. Golf carts must be operated in accordance with all State of Ohio traffic laws in addition to all applicable sections of the Greenhills Municipal Ordinances. Prior to operation on our residential streets, a golf cart must be registered with the State of Ohio as a motor vehicle and inspected by the Greenhills Police Department. Once a golf cart owner is ready for an inspection and contacts us at 825-2101, an officer will come to the owner’s residence or Greenhills business to conduct the inspection. INSPECTIONS ARE PROVIDED TO GREENHILLS RESIDENTS OR BUSINESS OWNERS ONLY FOR GOLF CARTS TO BE OPERATED IN GREENHILLS. The officer will verify the owner’s valid operator’s license and proof of insurance, and visually verify all of the equipment that is required by Ohio law to be present on a registered motor vehicle. This includes seatbelts in the front of the cart, a horn, taillight and reflectors, license plate light in the rear and license plate brackets, working headlights, horn, rear view mirror, windshield, turn signals, proper steering and brakes, and windshield wipers. Issued a Golf Cart Safety Inspection sticker, effective for one year, for placement on the rear of the golf cart. We are ready to conduct the inspections now and welcome your calls. Once the golf cart has been successfully inspected and issued a sticker, the operator must obey the same traffic laws that apply to all other vehicles in addition to those that specifically govern golf carts as listed above. This ordinance provides our residents with a mechanism to have some fun. We hope all who use carts on our streets enjoy themselves but ask that while doing so, they operate them safely and in compliance with the law. R esidents have reported receiving scam calls involving the Affordable Care Act. The scam is just the latest in a string of those deployed by criminals looking to swindle residents out of money. About 1,200 Ohioans reported they were targeted by scam artists this year, according to Attorney General Mike DeWine’s office. Those included scams made by phone, on computers and through the mail, his office said. The best way residents can avoid falling for these con artists’ lies is to be aware of their schemes, he said. Older residents are often the target of scams, according to the AARP, who said seniors should use caution when a caller requests personal information. In the Affordable Care Act scam, callers are taking advantage of consumers’ uncertainty surrounding the law, according to the AARP. “Posing as insurance agents or representatives of the federal government, these scam artists try to sell fraudulent policies or obtain sensitive information like Social Security and bank account numbers,” a press release from the AARP said. The Ohio Attorney General’s Office received more than 1,670 identity theft complaints in 2015, an increase of more than 300 from 2014. Anyone who believes someone has attempted to scam them should file a complaint online at www.OhioAttorneyGeneral.gov or by phone at 800-282-0515. A foreign-based group is hiding information-stealing malware inside Christmas-themed mobile apps. The group appears to be engaged in both economically-motivated Internet Protocol (IP) theft and gathering intelligence which could be useful to governments. These hackers are seeking documents that provide classified data from software companies and government organizations. The malware takes files and screenshots before sending them to a command and control server in Germany. The group is actively recruiting mobile app developers and has been pushing out Christmas-themed mobile games loaded with malware, which connects back to the same IP address in Germany. The malware has already infected approximately 8,000 devices and is designed to steal data from the victim’s devices including contacts, SMS, call records, location information, calendar, photos, and browser history. Beware of what you and your family members install on your smartphones! sources such as I-Tunes or Android Play Store. The Greenhills Police Department is in the process of developing a community based block watch organization and is looking to find interested citizens who would like to participate in the program. The block-watch program will be designed to focus on matters that are important to the residents of Greenhills. The police department will work in conjunction with block watch members to reduce crime, the fear of crime, and improve the quality of life for all of the people that live and work in the Village. If you would like to be a member of this proactive group, you can either call the Greenhills Police Department at 513-825-2101 or apply online. Apply here. Once the program is underway, we plan to conduct training for block watch members, along with regular meetings. We hope citizens are interesting in joining us to keep our community safe! The Greenhills Police Department, in partnership with our citizens, will excel in providing dependable and professional service to ensure the safety of our community. Ohio’s children are required to use belt-positioning booster seats once they outgrow their child safety seats until they are 8 years old, unless they are at least 4 feet, 9 inches (57 inches) tall. First responders from throughout Hamilton County, including representatives from the Greenhills Police Department, met today to announce the formation of a task force to combat heroin in our communities. For more on the story, click here. Latchkey Kids . . .
40% of American children are left alone everyday. These 'latchkey children' need special help - they're uniquely susceptible to unsafe situations. To see statistics, other information, and tips for latchkey kids, click here. For a checklist of suggestions and a resource that you can use to help your child in case of emergency, click here. In December 2013, the Ohio General Assembly expanded the state’s “Move Over” Law, which requires motorists to cautiously shift over one lane — or slow down if changing lanes is not possible — when passing any vehicle with flashing lights on the side of a road. Its purpose is to protect everyone who works on our roads—including thousands of law enforcement officers, emergency personnel, construction workers, tow operators and many others—and everyone who travels on them. To learn more, click here: MoveOver.Ohio.gov. Seat belts are the most effective safety feature ever invented and have helped save thousands of lives. Sadly, one in five Americans fail to regularly wear a seat belt when driving or riding in a motor vehicle. If you "Click It," we won't have to "Ticket" and we will continue to reduce seat belt fatalities on Greenhills' safe streets.